Banking on our enriched industry experience, we are engaged in offering a huge gamut of precision end mil grinder. We make use of the best grade raw materials that are procured from reliable vendor base of the market. 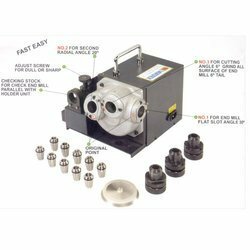 Our company is highly instrumental in offering this superior make precision end mil grinder as per the diverse application needs of our international clients. Wire Dia: 1.00mm to 5.00mm. For information kindly download the attached file. This machine manufactured in cast iron body with good mass (weight) gives no vibration and noise. Spring end grinders gives smooth finished and also controls E1 and E2 values. Das Precision Machine Tools Pvt Ltd.
Spring end grinding machine is used for facing of compression spring ends. After cutting coil spring, insert springs in magazine from one side & get finished product from other side. We have come up with spring End Grinding Machines with fully automatic program control approved by UL and CE. This is latest technology which adjust the speed of spring feeding plate depending upon time required for grinding the spring. Precision end finishing, even for the smallest of springs can be achieved on a number of purpose built grinding machines. - Single scoring station for standard configuration.Double scoring stations as optional, which realizes 0mm score-to score distance. 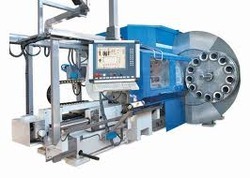 - Automatic blade grinding device, with automatic lubrication and cooling for the blade-edge. J.S. Corrugating Machinery Co. Ltd.
B M S Machine Tools, an ISO 9001: 2008 certified and SSI & NSIC registered company, is engaged in manufacturing Dry End Grinding Machines. Mini Iron & Alloys Pvt. Ltd.